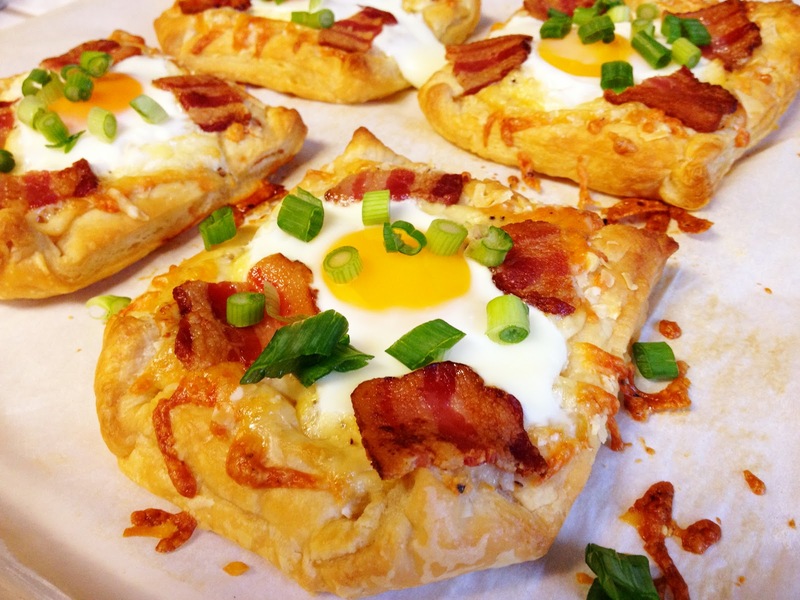 This egg, bacon and cheese puff pastry tart was delicious. I had always thought I wasn't a big fan of runny eggs, until now. I made this even better by using a peppered cheddar cheese, but you could use regular cheddar or your favorite cheese. It will still be delicious! 1. Preheat the oven to 425 degrees F. Line 2 baking sheets with parchment paper. On a lightly floured surface, roll out the puff pastry into a 12-inch square, then cut into 4 equal squares. Slightly fold and pinch the edges of each square to form 4 round tart shells. Transfer to the prepared baking sheets and prick all over with a fork. Bake until golden, 8 to 10 minutes. 2. Meanwhile, cook the bacon in a medium skillet over medium heat, turning, until crisp, 8 to 10 minutes. Transfer to paper towels to drain, then crumble. 3. Let the tart shells cool slightly on the baking sheets. If the centers are very puffy, prick with a fork to deflate. Sprinkle evenly with the havarti and parmesan. Make a shallow well in the cheese in the center of each tart and crack an egg into each; season with salt and pepper. Top with the bacon, then return to the oven and bake until the egg whites are set, 10 to 15 minutes. Top with chives.